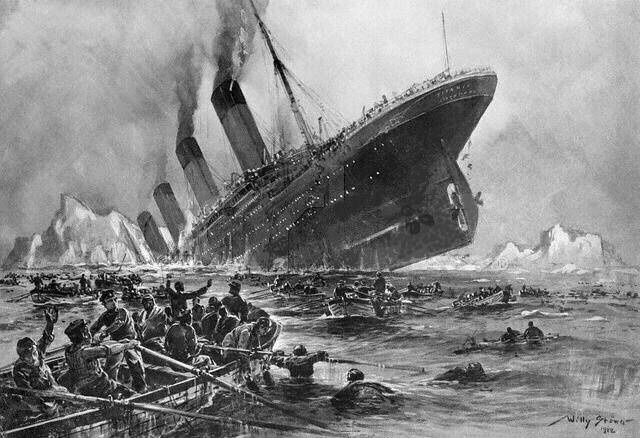 For some reason the fate of the Titanic has always resonated with Irish people. Is supect it is for more reaons than just the enormously important Harland & Wolff connection. In many ways the connection with the Titanic stems from the distinctly unglamorous side of the affair, those passengers in third class who were on board but distinctly third class. They were the many who paid little individually but financed the whole operation. Many of them were Irish and many of them died. Of course, most of the passengers died on that fateful night and early morning. Over 1,500 men, women and children. It was a combination of arrogance, disbelief, bad reaction to the crisis and poor lifeboat capacity (and bad management of the evacuation which saw lifeboats leave the stricken ship less than half full) led to their deaths. It was a tragedy in every sense of the word. For individuals and their families and a tragedy for progress, for invention and a tragedy for science. It shattered dreams. Written by: Eoinpurcell on 14 April, 2010.on 4 August, 2010. One Response to "Today In Irish History – The Titanic Strikes An Iceberg On 14 April And Sinks On 15 April"